Hold the phone. I just found out you can regrow food in water without dirt. Could gardening get any better when you have two black thumbs? I think not. And my black thumbs aren’t the only reason I’ve been hesitant to garden. It can be costly too, but ever since I found ways to water my garden for free, I’m all over it. Then my step-mom showed me how to regrow food in water – she had a couple heads of lettuce in a bowl in her kitchen. But as it turns out, it’s just one of several veggies that can grow without dirt, and without much effort too. 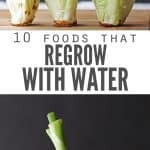 It’s great news for those buying organic vegetables, but even if you aren’t, it’s a simple way to stretch those grocery dollars just a teeny bit further is to regrow food in water! Why Should You Regrow Food in Water? You already bought the vegetable. All it costs is a few tablespoons of water – but if you’re smart about it, you can re-use water you’ve already used elsewhere, like from boiling pasta or water that you collected while waiting for the shower to get hot. Then it wouldn’t cost you a dime! (2) It’ll trim your grocery budget. Little ways to save money really do add up to bigger savings, as long as you’re diligent about using them. Now, you won’t get a huge harvest out of any of these items, but it is still food and every little bit helps. Even if it’s a few leaves of lettuce to scoop your tuna salad with, you can regrow food you didn’t have before and won’t have to buy. (3) It makes organics more affordable. Affording organic food just got easier! If you start with organic food, you’ll regrow food that’s organic… so you’ll reap the benefits of organic greens without actually paying for them! Do I have to explain further? I mean, stick the plant in water and watch it grow. Really – it’s that easy! I’ve listed below all the vegetables that can legitimately grow in water and water alone. Sure, there are plenty more that can START in water and then be transplanted to soil. And yes, beans will sprout in water too – but unless the vegetable will grow into more vegetable that can be eaten as-is with only a cup of water, I kept it off this list. You don’t need a lot of water – just enough to cover the roots. About 1/2″ of water seems to be sufficient otherwise the food can get moldy and slimy. Be sure to check the water every 2-3 days to ensure that A) there’s enough water, and B) no rogue lettuce pieces fall off and slime up your bowl. The size of container should be relative to the size of the food you’re growing. Lettuce and celery grows best in shallow bowls like these. Green onion and lemongrass can be in taller, skinny glasses like these. You can regrow multiples of the same plant as long as you’re not overcrowding the area. I haven’t tried this myself, but using a fertilizer could help with the yield when you regrow food – especially if this is more than a fun side project. I would recommend this Dr. Earth organic liquid fertilizer or a hydroponic fertilizer. Cut off the bottom of the stalk and place in a small bowl of water. New growth begins from the center in 1-2 days with significant growth in less than a week! Place the root end in a shallow bowl of water and watch it regrow from the center. Be sure to harvest on the smaller side to get the best flavor. You can’t regrow an actual carrot, but you can regrow the carrot tops! Place the cut-off end of a carrot in a shallow bowl of water. Harvest the greens as they grow and add to salads. Better yet, make this amazing carrot top pesto and stop spending money on store-bought! 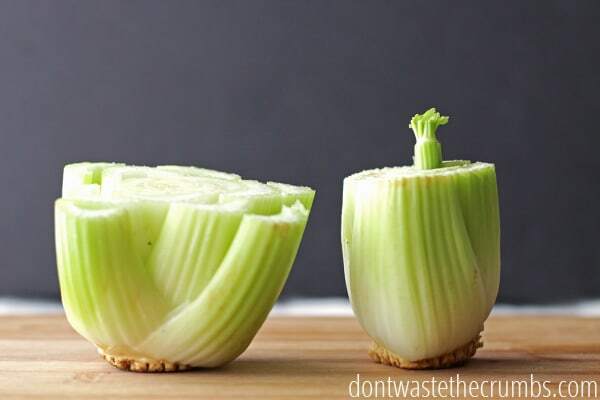 Cut off the bottom 2″ of the stalk and place in a small bowl of water. New growth begins from the center in 3-4 days. It might take awhile for a full stalk of celery to grow, but you’ll get great growth in the center for flavoring dishes. If you don’t know what to do with the leaves, dehydrate them and make your own dried celery powder. Cut off the bottom 1″ of the base so that the roots are intact and place in a small bowl of water. Garlic chives are the green that grows from a clove of garlic and can be added to dishes that traditionally call for green onion chives like salads and baked potatoes. Place a garlic clove in a small cup and add water to the bottom without submerging. Roots will grow in a few days and shoots will grow shortly after! Keep the white part of the onion with any roots that are in still intact. 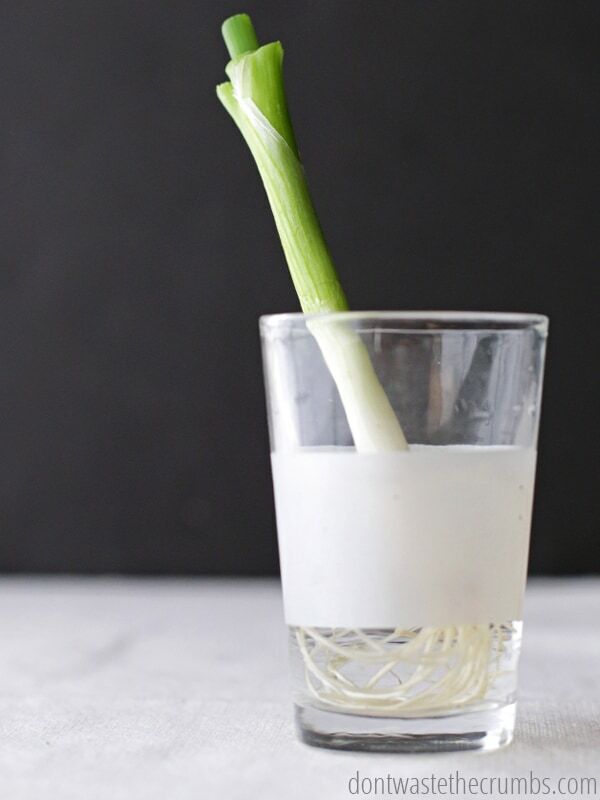 Place in a glass with water and you’ll have a never-ending supply of fresh green onion! Cut off the bottom 2-3″ of the stalk and place in a cup of water. New growth will come from the center of the plant. Usually only the green part of the leek is used in cooking, but it can be used interchangeably with onions for a delicious, mellow flavor. Cut off 2-3″ from the bottom and place in a tall container with 1/2″ or so of water. New lemongrass shoots will grow from the center. 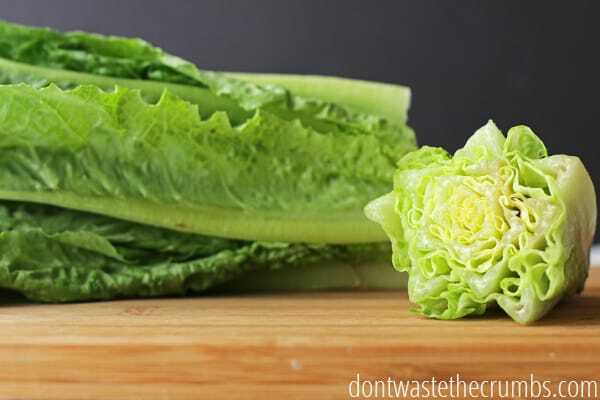 Cut off the bottom of the head of lettuce and place it in a small bowl of water. New growth begins from the center of the in as little as 3 days and you’ll have a new half-head of lettuce in about 2 weeks. I’ve heard romaine re-grows best, but I’ve had success with green leaf and red leaf lettuce too. Got more scraps to regrow food? There are plenty more vegetables that will regrow using just a small scrap of the original food. These listed below can be started in water, but should be transplanted to dirt for full growth and harvest. And of course, you can save the seeds/pits from apples, cherries, lemons, nectarines, peaches, peppers (sweet and hot), plums, pumpkins and tomatoes to grow your own new vegetables! We have several heads of lettuce regrowing on our kitchen table, which makes for a pretty and practical centerpiece! If you had a shelf near a window, you could keep all your plants there and just harvest when they’re big! Just think – if we did all of the above ways to regrow food, we might not ever have to shop at the grocery store again! 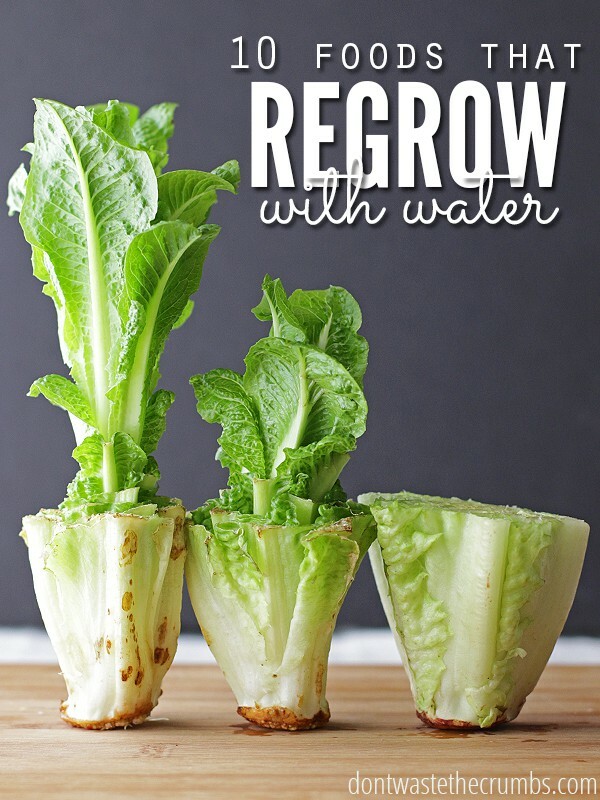 It’s so easy to regrow food in water! You’ve worked hard to grow your garden or pinch pennies to afford organics or are doing the best you can with your budget — now it’s time to stretch those dollars even further and grow food in water! Start with one of these shallow dishes or these taller dishes. Add in the food stumps (see above for details!). And keep the water fresh. Fertilizer could help if you really want to work this system. This Dr. Earth organic liquid fertilizer or a hydroponic fertilizer would work well. If regrowing your food in water isn’t your skill set, use those kitchen scraps to make chicken stock! Need ideas on how to preserve those extra vegetables? Have you ever tried to regrow food in water before? What did you grow, and how did it go? Share your experience in the comments! Wow – I had no idea!! Thanks for sharing this! Crazy!!! I’m so excited to try this. I did this with lettuce last year, I got 1 leaf, but it was so exciting to watch that thing grow! Just the bottom 1/2 inch or so Diana! Hi Tiffany, you mentioned that one can regrow pineaple. How do i do that, and will it bare fruit. Yes! You need to cut off the top and replant it. It takes 2-3 years, but it will bear fruit! I grow pineapples all the time. Every time I go to the local grocery I ask for the pineapple tops. I get them free as they throw them away. Twist the top off of the core. remove about eight green leaves at base. You will begin to see these little curly roots. Place green stalk in a glass of water only submerging about one inch in water. Change water daily. Roots will appear in about one week Once you get a good root supply you may then plant in pot of soil. I place mine outside In a sunny spot. (after all frost danger is over) Happy Pineappling! @Gary roos Adding to what Tiffany and Shea said, If you take care of them long enough they will even multiply. We have pineapples in our garden that have started to grow 2 and 3 pineapples from 1 pineapple top!! How about beets? I have one on water and leaVierves about 5 inch tall, should be planted on soil? I haven’t experimented with beets Vira, but my best guess would be soil since they’re root vegetables! if you just want greens you can leave the root in the water. I’m sorry Susan! The environment plays a big role in this experiment. This is great! One question though, when I see some of your plants growing there, I notice that you tend to leave a really large end piece of the vegetable–I never end up leaving that much, am always cutting as close to the root as possible. Must one leave as much as is shown in the photos, or can the plants grow from less “plant” than what is shown? Thanks! Hi Aimee! The picture might show more of the end that’s really there – it’s 2-3″ in length, where the end of the lettuce is more of the tougher center than the fluffy outer leaves. You can certainly try with less though, what do we have to lose?! I tried this with celery but only got leaves to grow from the center, no ribs of celery. Any advice? Amy, what’s working best for you? There are a lot of factors that may affect your growing efforts, like the chemicals in your water supply and so on and so on. Do what works best for you. I’ve successfully grown celery with only a half inch of the bottom cut from stalks. I place that in a shallow dish and add water to about half way up the ‘stump’. When roots are established I plant that just underneath the soul either outdoors in my garden – however since I live in Michigan I currently have my celery growing in a six inch clay pot. If you want to encourage light green stalks, wrap a collar of cardboard or newspaper around the young stalks up to the place where the leaves are growing. As the stalks grow add more height to the collar or replace with a taller one. Delicious and interesting to grow!! I have also tried to grow celery. Once it started sprouting I planted it in my vege patch. It grew well and looked great, but the celery sticks were circular and tough, not the hollowed, semi circle shape of a store bought one. What did I do wrong? This is great, I’ve grown some of these, but not all, but I wanted to make one correction. The greens that grow from onions and garlic do not become “chives” – chive is actually a plant all of it’s own, with onion chives and garlic chives being totally different plants. True chives have fibrous bulbs, like garlic and onions, but the bulbs aren’t edible, they are grown solely for their greens. That isn’t to say that the greens from garlic and onion aren’t edible, they are, they just are not the same as chives. It actually might be easier (and more fun!) to stick a single rogue clove of garlic into the ground in a spare spot of space (it needs about 3 inches square) and grow a whole clove from it! Thanks for the correction Amber – it’ll take me YEARS to figure out this gardening stuff, lol. If you stick a bulb in the ground, update us with out it’s going!! I don’t think you can ever learn everything about gardening. I’ve been (literally) gardening since I could walk and I sure don’t know everything – not even close! I did grow garlic the past few years though. It totally works. But don’t plant a whole head of garlic unless you want a LOT of garlic. You can dry it, but it doesn’t last forever. Then again, I’m cooking for one, so don’t go through it super fast. But each individual clove grows a whole head. I planted mine a few weeks ago and now have nice sized sprouts outside. You just let them grow until fall when the tops start to die off. Dig them up, braid the tops, and hang to dry! I *think* the tops are just called Garlic Greens or Onion Greens? Not positive on that though. You can also pickle them! Boy are those greens strong…my mother the first year I moved back to Michigan had a “herb garden” and she thought she pulled up green onions and gave them to me…took them home and sliced them up for salad….ruined the salad since it was actually the sprout for garlic that hadn’t come to a head yet…woah were they strong. Am age 75…having hard time keeping my gardening up (been doing it for 40 yrs). Really sad about not being able to do it much anymore. This water thing excites me tremendously. Can’t wait to try it. Wait till my daughter visits & finds vegetables in water growing on my kitchen table instead of a small vase of flowers, or maybe both! LOL – my dad thought it was pretty neat to see ours on our table too. It makes for a great centerpiece, and conversation starter! Other water gardening starts: when succoring tomato plants, take the cut-off stems, remove some lower leaves, stick in water, and you can root a whole new tomato plant. I also took moldy organic strawberries out of my fridg, smeared them around on top of pots of soil, sprinkled a bit of soil over them, watered them, and grew new baby plants! The pots survived outdoors on south side of foundation of house in cold W. Mass.’s long severe winter. Just planted them out in garden and are doing fine. I too have aged and find gardening harder. Some ideas: Bring the garden up to you! Hire someone to build you raised beds–as high as needed for you and not too wide for easy reaching. Try large pots on wheeled carts, trollies or in wagons you can move around to best yard spots. Plant in a wheelbarrow, half barrels, animal troughs, anything that raises plants to comfort level for you and fits your budget. Let everyone know what you’re looking for–try tag sales, recycling centers and charitable type stores. Use your imagination. Place pots on outdoor picnic tables or raised wide boards over work horses (carpenter’s benches, or other benches) or boards across 2 chairs or single chairs. I have some special planters you can buy that fit over rails of my deck and grow green beans, herbs and flowers in them. Love that I don’t have to bend down w/bad back & knees. Want to get more of these! Be sure your deck has sturdy rails–they get heavy when filled w/soil. Might need to recruit someone w/muscle power to place these or to fill w/soil, but love gardening this way. My deck is right off my kitchen–so handy when cooking w/my herbs. Enjoy, and don’t give up, if you love gardening, like me. just saying using old gutters for small plants help me not to get down on knees. i screw them to my backyard rails on porch. We made a hydroponic garden on the front porch using extra gutter pieces. In the end we could only grow herbs or root cuttings for new plants. I have used these earth boxes and I love them. They are fantastic. I just acquired 5 Earth Boxes from a neighbor and wondered… at the end of the season, do you find the roots have grown thru the screen into the water source at the bottom? I haven’t planted in mine yet cuz I snowbird and fill the back if my Odyssey with plants and continue my growing season in the deep south all winter. In order to save space, I had been carefully uprooting all my plants, placing them in plastic bags (so I could replant them at my winter destination) and stack the plant containers to save space. I am wondering if that will be more difficult with that screen between the soil and water? I’ve also tried the lettuce in water several times and once the greens appear, the lettuce suddenly rots and I have to throw the new start away. Any ideas about this? Tiffany, you are so inspiring I love all of your suggestions. The other day I cooked a butternut squash for dinner. I scraped out the seeds before cooking and dried the seeds on a paper towel (I don’t use these for much ,but do have them on hand)for a couple of days. I planted several seeds in dirt and WOW they have sprouted so beautifully. I will be able to plant them outside in the next week or two because we live in Canada and our growing season is quite short. I can hardly wait for a fall meal grown from FREE seeds. Thanks Diane! Great idea on planting the seeds from your squash – I hope they grow to be HUGE for you!! I am SO going to do this. Lately I’ve been cutting up and soaking lettuce so it absorbs lots of water and stays crispy and ready to use in the fridge so this will be an easy next step. Nobody likes the hard white parts of the lettuce anyways! I don’t have a lot of room but I like the centerpiece idea. These are great ideas – I’ve been sharing your post with all my friends! My house has a farm share starting next month, and you’ve inspired me to try growing from the leftover bits by putting them in hanging baskets in the windows of our sunny laundry room. Need to ask around and see if any friends have spare hanging baskets we can use. Hanging baskets are great for freeing up surface space – great idea Josephine! I have romaine and celery started now. I’ll definitely try the others on your list. I had no idea that you could ‘re-grow’ so many different foods! The green onions grow like CRAZY Tricia. Definitely try that one if you can! I started green onion in a former porch railing box. Super easy and you never have to replant IF you allow at least one onion to remain unharvested. Left to grow, the onion should form a big flower head, let that head complete it’s cycle and harvest the seeds. I haven’t had to replant onions for 2-3 years. Also with green onions, don’t pull the onion, roots and all, when you harvest. Pull the onion up to where you can see the root base and slice just above the root (leaving a tiny bit of the onion bulb. Push that remainder and roots back into the soil and you find 2 new onions start sprouting very quickly. I have noticed that the onions don’t mind being crowded together (especially when they replant themselves from a flower head) so I don’t fuss with thinning them. I use a lot of green onion in cooking, salads and my fave, home made guacamole. I accidently let my supply dwindle too much one time and had to purchase some. Instead if putting them in them in the frig, I planted them in my “onion box” and they rerooted and grew a little bigger…Eureka! More onions! I have done celery last year! It was great because I could go out and just pick one stalk, for cooking, rather then a whole celery root! I already have another one growing nicely in my garden for this year. I have harvested Leek and took the ends and re-planted. We’ll see how that grows! Lettuce seems to much work….it grows quickly and easily from seed, as well as chives and green onions. Great news Janet! Thanks for sharing! Wow, great tips! Thanks so much for sharing. Can you explain a little bit more for those of us who don’t have a green thumb? I tried doing green onions like this before but wound up with a disgusting yucky mess. How often should you change out water? Does this need to happen inside, or outside? What temperature does it need to be? If inside, does it need to be right under a window, or is anywhere semi-near sunlight okay? I’m a good cook but a horrible gardener…I have killed everything I ever planted. My friend has rosemary that grows like a weed, and I’ve heard the same about mint and cilantro, but all my herbs died! I bought a gorgeous hydrangea and it died. Great with animals, horrible with plants. Please help! Hi Jebbica, absolutely! Change out the water every 2-3 days, or when it starts to look cloudy. I keep mine inside on the either the kitchen table or kitchen, and both have partial indirect light. My herbs die too, but I’ve got the growing in water thing down pretty good – there’s hope for us yet! Gen – you’ll get a half head of romaine in about a few weeks. I documented the growth via Instagram – http://instagram.com/tiffanycrumbs! Hi. I have a head of romaine lettuce just transplanted to soil this weekend. It’s been in water for 2-3 weeks and has a single huge leaf. Looks nothing like romaine lettuce. Have to hold it up with a stick. Any advice? Without nutrients in the water for the plants to absorb, do they lose their health benefits over time. Would adding some liquid fertilizer to the water help to prevent this? My husband had the same question but I figure the nutrients from the head are depleted to continue the new growth. If you look at the heart of the lettuce/celery there are always “baby” leaves growing and this process is just continued when you cut off the outer leaves and aid the growth with water. With that said, it makes sense that the new growth would have less nutrients than the original plant that derived it’s nutrition from the soil. Tiffany, do you know how liquid fertilizers (ie Miracle Grow) hold up in terms of organically grown vs chemically treated food? I know organic would ideally be natural fertilized (ie compost) and pesticide free but are liquid fertilizers as bad as pesticides? Cha – I don’t know if it’s fair to compare fertilizers to pesticides, but a gentlemen at a local nursery (that specializes in organic plants) pretty much told me to stay as far away from miracle grow as possible, that’s there’s nothing “organic” in it. There are organic liquid fertilizers (Dr. Earth seems to be a respectable brand: http://amzn.to/1T5ppUB) I just haven’t read too much about them and I’m still new to gardening, so I don’t know the appropriate ratio of nutrients for the plants in water. Sorry I was supposed to write Char not Cha… Yeah well Miracle a Grow lists the amount of mineral percentages guaranteed but doesn’t list the other ingredients which is a little fishy. Of course minerals plants need are inorganic by definition but how and where the minerals are derived from I guess is the question. I wonder if we could mimic what people use in a hydroponic growing situation for infusing nutrients into water. It would seem that something along those lines could be applied here. Just a thought. I bet we could Brooke! I’m not proficient with the additives in a hydroponic situation, but would love to read more if you have any articles to share! Thanks for sharing! With three toddlers in the house, the amount of effort it takes to grow something in soil is just too much right now! Thanks for the inspiration to try something simpler. I think I’ll Google ‘hydroponic gardens’ and see if there’s info that’s easy to find. Do any of you know of a good site? I was curious, how long can you keep harvesting from one root end before you should start with a new root end? Will the new growth start a brand new root end you can put in water (doubling what you can plant in water)? Michele – no, the root end doesn’t duplicate, it just continues growing on the same plant. I regrow usually once, twice at max for lettuce and celery and green onions for 3-4 times. I’m a Canadian living in Belize (Central America). Oh Yeah!! I’m going to try growing the romaine, green onions, tomatoes… & more in water in my sunny kitchen. I Love the idea of lettuce on the table. So here’s a new idea… Not a water plant, but I know you all get pineapple in the grocery stores up there. I have it in abundance here. After I lop off the top, I plop those in the garden. I may be wrong, but seems a pineapple will pop up every other year from each plant. Long wait, I know… but I have about five juicy pineapples almost ready to eat… soon. And to think of the dozens & dozens of tops I’ve tossed out. Wonder if this can be done indoors? I think if you find a really juicy sweet pineapple at your store, take a chance. Hi Suze! Yes, you can start a pineapple indoors. Whether or not it survives outside will depend on where you live (in the States), but I’ve heard that some warm climates have success. PS – I’m slightly jealous that you’re in Belize. We LOVED Central America when we visited – it’s so beautiful! Suggest getting a full spectrum light if sunlight is minimal. I try to keep my kitchen table clear but a planter in the center is a good plan (it’s NOT clutter so a good idea). We have a ceiling fan with 5 bulbs in the light fixture. One grow bulb would probably do it. I am about to harvest my first trans-state pineapple. It’s SO nice to leave it in the ground until it’s ripe. It’s not real big but it may be stunted cuz the pot I grew it in probably isn’t big enough. It took 4 years (I have heard it should have been 2 but I never fertilized it until last year). I started feeding it an organic granular fertilizer and bingo, a tiny fruit appeared. It did great in the south and slowed down a lot when it came back north (summers are not consistently hot enuf is my guess). I may harvest it this week. Helen, How did you start? In water? and how much of the top leafy part did you use? Polly: I twisted the crown/leaves off the top. Some people cut off the bottom and let it dry out slightly. Grower’s choice. Stripped off the lower leaves. Let the crown dry out for a day or two. Stuck it in dirt. Kept it outside (CA) in a sunny location. Watered consistently. At one point, I thought the plant was dead. NOT. Just thinking about producing a pineapple. About 18-24 months later, saw the start of a tiny fruit. Six months later, a small, very juicy pineapple! The sight of a growing pineapple, as well as the taste, were worth the time and effort. Try it and be patient. I do this with green onion, and I love it! I’ve never tried any of the others though, but once my family grows I would definitely be up for saving money this way! I love having green onions ready for meals. They make it look so pretty! I’m going to try some of these out. I’m thinking that if nothing else, this would be a great way to bulk up the veggies for soup stock. With only two of us home now, I don’t need the volume of food I did when the kids were here, but I toss veggie scraps in the freezer for stock. Yes, what a great idea Leni! I have started an avocado seed in 6.0 PH water from my Kangen water machine, it has a 1-1/2 inch root. The I started Ginger root and has a little more than 1 foot sprouts on four small cuttings in dirt and watered by the same water, both about a month ago. This is the first time I’ve ever tried to grow anything. I had no idea this many veggies could be grown in water. I’ve only tried the green onion:). My wondering is this… Can they be as nutritious as they were in their “first life”? Where would they get their nutrition from if they’re only pulling from water? I am currently growing celery in water from an article I read on Pinterest. It’s now 7″ tall. I will definitely be trying the rest of these vegetables. Thanks Tiffany. That’s huge Sandra! Way to go! I’m happy I looked this up! 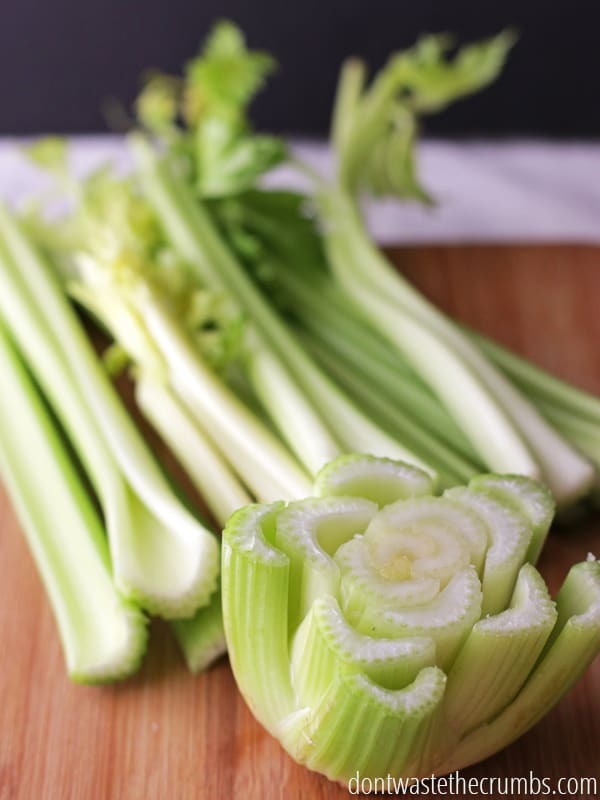 I had heard about regrowing plants in water, and as a northeastern American expat in Singapore, the celery I’m used to for eating raw and cooking is an imported good, and quite pricey. I know I’m not going to get huge regrowth at a time (I’m only here for 15-week shifts) but I’m going to see what I can get in that short period with the equatorial sun streaming through my windows! Even if I just get a bit of the yummy leafy stuff, I can surely add it to soups! Great blog, and I’ll look forward to reading more. Oops – put two websites in and the form didn’t like that. Above is my Singapore blog and here is my cooking blog: accidentalchef527.blogspot.com. A great way to free up space for this kind of thing is a shoe caddy. Hang it on a well lit north wall and put mason jars in each of the shoe sleeves. While it won’t work for many of the bulkier veg, it will certainly work great for the narrower ones. And keep them out of the way. I shared this on my blog, lots of credit to you of course! Your blog is gorgeous. There’s plenty more vegetables that will regrow using just a small scrap of the original food. These listed below can be started in water, but should be transplanted to dirt for full growth and harvest. avocado basil beets cilantro ginger lemon balm mint mushrooms onions (white/yellow/red) parsnips pineapple potatoes rosemary sweet potatoes turnips. Please give the way to grow mushrooms – I am eagerly waiting for this experience. what part do you use on the beets and turnips? Avocado regrows from “small scrap of food’? News flash: all plant food crops are produced from their seed. Jim, you’ll notice that the article mentions that mushrooms can START in water, but must be transplanted to dirt for full growth. I’ve just started to regrow lettuce 4 days ago and there is already of bunch of growth! But as the new lettuce grows should to take off the old outer lettuce leaves or just keep them on? Great collection, I can definitely say that this post helped me trim my grocery budget. 🙂 Thanks! I have been trying the lettuce and celery thing for months and they end up rotting put at the root. Any suggestions? This! Every time. Any hints? Shana and Krissy – I would try a cooler spot in the house, changing the water more frequently and using less water altogether to see if that helps! Love this!! Sharing it on my blog. Thanks for the awesome advice. Keep it up. Has anyone tasted the results of what is grown? I successfully grew lettuce but it certainly wasn’t the same as the original product. If this is so simple how come it isn’t done by everyone? Great post Tiffany. I’m already growing spring onions, but can’t wait to give all these other vegetables a go. Thanks for sharing. I believe the rule of thumb is… it’s easier to go from soil to water than vice versa. Thanks for the tip Helen! This is awesome. You can even create simple hydroponic systems with bottles. I heard about doing this from Mother Earth News magazine. I’ve already tried romaine lettuce and the eyes from sweet potatoes and it really works. I actually put my in soil not water but I am going to try your method too. It really works. This is great for those of us who are in a tight budget an love to experiment with food. I’d like to try garlic and onion. Thanks for all the comments and reply’s/ hints from people. I’ve been enjoying watching the green onions grow since I found your post a couple of weeks ago. They’re tall enough to try now! I have celery and leaf lettuce to try growing, but still debating on containers. I’m thinking glass would be best, but other than jars there aren’t a lot of glass containers that can be sacrificed in our house. 🙂 Has anyone had success with metal mixing bowls? We have a coated set we don’t use that might not rust, but metal isn’t a good idea for a lot of things. And plastic seems like it could be iffy too. Wow, this is really cool. Going to try this next time i get one of these veggies! I’ve something like this for a few years, but I plant right inside rather than having thing start in water. I find that the cores of many things like lettuce and celery are all that are needed. I use a ton of green onions in my cooking and started with those. When putting in dirt you only need less than half an inch of the root end, just make sure that the top (the cut edge) stays above the dirt so it won’t rot. I find a few things tend to shoot straight into flowers and go to seed… Works for me, I now have tons of seeds to grow more things from. If you core a full sized onion rather than slicing off the root end (use a paring knife to cut a cone shape with the roots) you can plant that too, again leaving the top exposed so it won’t rot. I have pots along my patio and hanging from my patio roof and will randomly run out and plant a few seeds out of something I’m eating. I have grown melons, green and jalapeno peppers, tomatillos and tomatoes this way. I currently have a strawberry patch starting from a few seeds I planted earlier… seeds I cut off the outside of a strawberry I ate. Planted a few pomegranate seeds as I way eating one and now have a couple of 3 foot trees that should start giving fruit in a year or two. I once bought an Asian sweet potato from my local Asian market, simply to try it. It hung around for quite a while waiting for me to figure out what to do with it and began to sprout. I cut off a tiny bit of potato where the sprout was and planted it in a deeper planter. I now have a beautiful, huge, green plant (unfortunately a type of deadly nightshade and not edible itself) growing in a 1×4 planter. I have harvested several Asian sweet potatoes from the deep pot over the last few years and it just keeps growing more. This year I cut up a regular Idaho russet that got a bit big in the eyes… It too is growing wonderfully and although I haven’t harvested any yet, I assume that baby potatoes are quietly growing underneath. Not all of them work out, more to the fact that I have no clue what I’m doing and live in a state where 115 degree summers are common (very hard to figure out how much to water). If something fails, no biggie, it cost me nothing. I don’t even get good soil. I buy the cheapest top/garden/potting soil I can find. My goals keep getting bigger… trying to start a peach tree from a pit as we speak. Glad you are spreading the word about this and hope that others out there are inspired, even if just a little. Wow wonderful article an great tips. Thanks as well for the free download. Thank you Randy – and you’re welcome! This is such an amazing idea. I have been worrying over how to go frugal and seriously save money while not sacrificing my favorite food. Lettuce is one of them. I NEED them for salads and I am from India. Lettuce is much costlier than any other normal local food products. It would save me a lot of money if I am able to regrow it in my house. Moreover, it isn’t available everywhere. I have to drive 10 kms for lettuce only. thanks a ton for sharing this idea. Garlic is the easiest to grow. Just get one head and separate the cloves. Plant in November, put in point up about 3-4 inches deep in the dirt. Each clove will become one head of garlic! Harvest in summer when tops start dying off. Can be done in a pot, raised bed or ground. I got 50 heads last year needless to say I am sharing garlic with friends and family. Great article! You can also grow these And many of those under the list “Got More Scraps” above where it says they then need to be transported to soil, with aquaponics. Aquaponics does Not use soil but is an eco-system where fish waste provides the nutrients (very simplified explanation). Not sure if I can post our site, so I won’t, but searching for the term aquaponics will give your readers lots of info. Thanks. I tried growing carrots in water, and I was pretty excited to see the greens sprouting. I put them in a saucer and added water every time I saw them get low. Roots began growing out of the cut carrot part. The carrot part eventually began turning brown, but the greens were still pretty healthy. Eventually, I took the greens and put them in my soup stock freezer bag collection of scraps. Yet another way to save money! Yippee! Growing food is a closed system. There’s the law of “Conservation of mass” – Matter can not be created or destroyed. Yes, growing these plants is absolutely possible, but just know that the nutrition you get from them is limited to what the plant can absorb. And that’s a lot less when using just water versus planting in a mineral-rich soil (or even using a hydroponic medium). There’s a reason why you have to keep adding compost and/or fertilizer to a garden. This is surely handy for garnish or for a fresh winter crunch. But don’t expect to live healthily off of plants grown in this manner. Agreed Bryan! In addition to Hydroponics (which uses chemicals) these grow great in an aquaponics system (except for root crops – which grow great in a wicking bed – using water from an aquaponics system works excellent for adding nutrients). I touched on it briefly in a reply above. Basically aquaponics is closed loop eco-system where fish waste provides nutrients for the plants and the plants / pebble beds / filters clean the water for the fish. It is all organic as no chemicals can be added or it will kill the fish. The fish also grow of course which you can eat too! Food grows much faster than soil gardening and it uses significantly less water. Don’t forget about photosynthesis! I agree that plants growing inside in water will have less nutrition than the original, in most cases. But while saying that the plants are not getting many additional nutrients from the water is technically true, the plant is making its own food with nothing more than water, carbon dioxide and sunlight. I am presently just starting some celery. The one questions I have is what about nutrients? When plants grow in soil, they must get nutrients. If there are no nutrients added to the water, then they won’t be as “good” as those grown in soil. Hi John, regrowing food in water isn’t meant to replace the food you’re normally eat long term. It’s just a simple way to get a little bit extra of what you’re already buying. The nutrients might not be as dense or as “good” as you say, but it’ll still be better than half the processed junk on store shelves! Interested in plants that one can grow with water, and water and soil. I live in Manitoba appoximately 2 1/2 hours north of Winnipeg Manitoba. Growing veggies in water… When you say put in a small bowl of water, does the mean you submerge it in water or just enough water to cover the base? Just enough to cover the base. The size of the bowl should be proportionate to the food you’re growing. Love this ! My lettuce is doing great. My green onions were doing well also, then they began to rot. Where did I go wrong? Suggestions? Love this article! I started a celery about 2 weeks ago and I have a cute little celery bush on my sink. 3 days ago I started a leek the very center leaf has grown at least an inch, the roots are growing too. There are no roots on my celery yet. Hi I would like to know can you grow white or red cauliflower the same way. In fact can you grow anything with a stem like a lettuce or cauliflower like that. 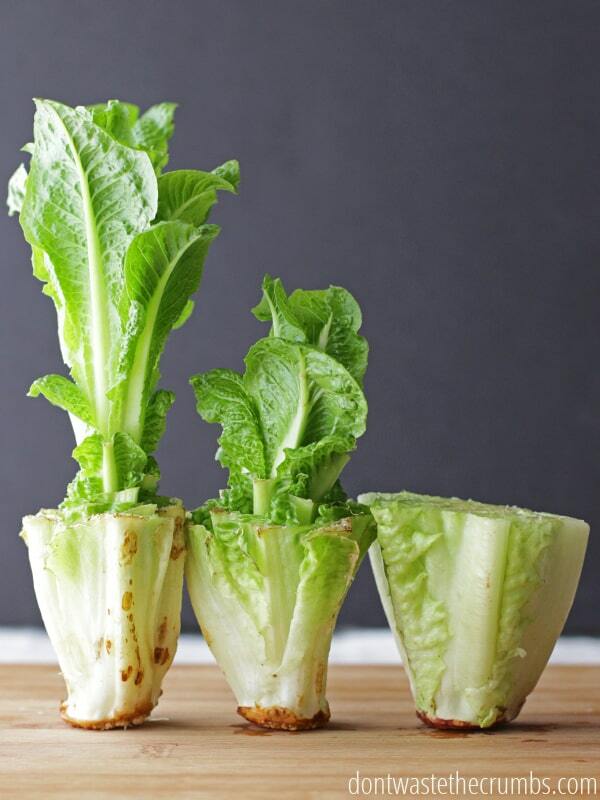 I tried this with Romaine and was excited as it started to grow, and then after two weeks the barely 1″ tall growth started to darken and shrivel. There was still water in the bowl it was in, it just started to shrink and now of the three leaves it did have only the tallest, the one barely 1″ tall is almost gone. I’m not sure Ruth! It’s always worked for me, but it hasn’t always worked for others. My suggestion would be to try again, maybe try more/less sun? Have you successfully grown a cherry tree from a saved cherry pit? If so what steps did you take? Not yet Brandie – we don’t own our home… yet! I can’t wait to try this-thanks for sharing! I never knew you could do this! I just started growing my own lettuce. It’s amazing that you can grow these vegetables in water. I will be doing more. Thanks so much for sharing. I started some romaine lettuce in some water as directed. Mine has had long stems with leaves coming off them. It doesn’t look anything like the picture. Ideas? I do this often and find that some things go straight to seed… Doesn’t give you anything edible, but if it flowers and goes to seed you can grow many of them from the seed and still have paid nothing… Probably need to involve some dirt though. I have don’t this with several different lettuces and now can plant tons of seeds. I tried this with leaf lettuce and all I got were thin shoots on the sides. Total failure. What kind of light is required? I used sunlight Marian, and I’m sorry it didn’t work for you. I encourage you to try again anytime you buy lettuce. There are lots of variables at play here, but you’re only out a few tablespoons of water if it doesn’t work! i’m in the process of doing this now with Foxy Romaine Lettuce – thus far Success! it’s amazing to see. I am going to add more to the collection! yum!! At what point do you take off the old bottom portion of lettuce or celery that gets brown, dried and slimy? I cut mine today with a scissor. However, when I looked at the bottom (lettuce), there were hairlike roots, so I just put it back in the water. I also had an erroneous stalk growing from my lettuce, so I cut it and put it in a separate bowl of water. I managed to have a small head of lettuce prior to this stalk. Thank you for the idea! I should clarify…I have new growth of celery and lettuce growing, but the original surrounding leaves and stalk are now shriveling and brown and slimy. You won’t get much when you regow Farid, so the point isn’t necessarily to get a ton of nutrients, but to really get the most you can out of the food you buy. I’ve had success regrowing green onions and celery this way. Now I’m going to try romaine. I’ve learned that I need to use a clear glass container, and change the water every other day. I have a water softener for hot water, and a drinking water system, so I make sure to dump out old water and refill with the cold, hard, regular water, which will be more mineral-rich. People having problems – it could be your container, your water, or you may not be changing the water often enough. Quite interesting would like to try it. I’ve tried celery several times, but the root always ends up rotting. I use minimal water. I get new shoots or stalks starting, but the bottom piece always gets moldy and rots from the water. Any suggestions? Hi, I would love to grow mushrooms, how do I go about it? One thing: garlic chives are not just the greens from garlic. Chives and garlic chives are relatives of garlic and onion and leek and shallot, but not same thing. I’m regrowing celery and saw on another website to eventually place it in soil after about a week. 2 Questions: do you move your plants to soil or do you keep them in water forever? Another commenter on a different website said that growing veggies for too long can deplete the nutrients in the soil so much that the plant wont be flavorful. Any validity to this statement? Hi Tiff, good idea. Can’ wait to start. This is great. Always looking for a way to save those dollars..
Great post!! I tried celery last year, but wasn’t successful. I also tried green onions and they were super easy to regrow. It was the gift that kept on giving. We just put the root of a head of romaine lettuce in a small dish of water last night. We’ll see how that works out. Question. My shop bought parsnips have started to root from the side. If I plant the cut out pieces will I get some quick start parsnip plants? You might Gennie! Parsnip is a root veg, so you’ll have to replant into dirt for sure (not just water), but you might sprout some leaves and future veg. It’s worth a shot! I tried what you said…with red onions. it turned out to be failure.roots were grown but then it started rotting. i tried many batches ending with same result. What should I do? Hi there! I love this post and will definitely be trying it out. I’m on holiday at the moment and it’s driving me crazy that I can’t just go and start this up straight away! A quick question about the fertilisers: I have a vermicomposting bin (worms to the rescue) and a by-product of the compost you get is liquid that is very rich in nutrients. I’m not too sure what this liquid is but I know it can be diluted into a plant fertiliser that works well in soil, but would it work well in tiny amounts in the water too? I don’t garden and hate wasting it so would love if I could use it for this! I haven’t tried it myself Flora, but if your only option is to waste it, I’d give it a shot! The celery takes at least a couple of years to grow, so be patient. Also it would behoove you to know what soil to plant the potential foods in. Some like different soils. And celery. All growing inside in January. Perhaps year round. Still working on that. Thank you for your article! It’s fun to regrow food and while it may save a little money I’d be concerned about the nutrient content of plants growing only in water. I think that is why you can only regrow them one time. The inner leaves probably use up any nutrients left in the outer leaves, then all is depleted. You may end up with more nutrient rich veggies if you stick it in a pot of good soil after you see roots appear or just put it in the soil from the start and keep moist. I’ve done it the latter way. I have my celery started in a shallow bowl. I wish I would have know that you can grow green onions the same way. I just put a bunch of the roots in my compost pile. Oh, well next time. I’m also going to try the lettuce. Thank you for this information! While it is fun to watch, this is not a good source of food supply. Vegetables get their nutrients through soil and sunshine; you will not be getting any nutrition from regrow not veggies in water. You could start them in water and then transplant to soil but will still be void of as much nutritional value. This never seem to works for me. Once they start to grow new leaf, the stem will start to rot. I did with onion and loved the results and now my balcony is filled with onions,tomatoes and starting seedlings for kiwi and avocado.